John Kerry’s upcoming talks in Beijing will be keenly watched in Moscow and New Delhi. Major policy challenges lie ahead for Russia and India. The United States Secretary of State John Kerry arrives in Beijing this weekend. This signifies the first structured high level political exchange between the US and China in President Barack Obama’s second term as well as since President Xi Jinping assumed office. Indeed, some amount of “groundbreaking” had taken place during the visit by the US Treasury Secretary Jack Lew in the third week of March, who also happened to be Xi’s first visitor from abroad after becoming China’s president. That the two countries are approaching politics through the gateway of economic partnership needs to be noted at the outset, given that a curious pantomime of cooperation and competition constitutes the Sino-American relationship at this point in time. The ghost at the table where Kerry sits across his Chinese hosts will be the US’ “rebalancing” in Asia. Kerry hinted once at some unease that the “rebalancing” had an excessive military projection, which worried China. Since then, of course, the Asia-Pacific security has dramatically changed. If anything, there have been or are in the pipeline an unprecedented scale of US military deployments in China’s neighbourhood. These include the deployment of fourteen additional ground-based interceptors at Fort Greely, Alaska, and the planned deployment of another TPY-2 radar to Japan. The US has also moved two guided missile destroyers to locations in the Western Pacific and has announced the intention to deploy a Terminal High Altitude Area Defense System ballistic missile defence system to Guam in weeks. And all this has been couched as “precautionary moves” to strengthen the US’ defence posture against a North Korean missile threat. “In geostrategic sense, containing China in the Asia-Pacific region is the basic content of the US policy toward China. There are three major means for the US to conduct deep involvement in the Asia-Pacific region: first, wide alliance to win over various countries in the Asia-Pacific region; second, military forward deployment to realize strategic ‘re-balancing’; and third, occupy a ‘leading’ position in the region to play ‘pro-active role. But then, Washington has also asserted emphatically this week that the US’ “rebalancing” policy is for the long haul. The major policy speech “The US Defence Rebalance to Asia” by the Deputy Secretary of Defence Ashton Carter at the Centre for Strategic and International Studies in Washington on Monday was not exactly the “curtain-raiser” to Kerry’s visit that his Chinese hosts would have hoped for. Carter said, “The end of the war in Iraq and the reduction in Afghanistan allow us [US] to shift the great weight of effort from these wars to our stabilizing presence in the Asia-Pacific region.” The withdrawal from Afghanistan meant that US is “turning a strategic corner”, which in turn enables it to embark upon “a great strategic transition”. Deployment of the 4th Forward Deployed Naval Force SSN to Guam. Carter disclosed that 6 out of the ten US Navy destroyers that used to be permanently based in Rota, Spain, to provide ballistic missile defence to the European allies will be shifted to the Asia-Pacific. Again, the destroyers and amphibious ships deployed in humanitarian missions in various parts of the world will be re-deployed to the Asia-Pacific. Alongside, the US Air Force will also shift its capacity from Afghanistan to the Asia-Pacific, including intelligence, surveillance, and reconnaissance assets like the MQ-9 Reaper, the U-2, and the Global Hawk, apart from B-1 bombers to augment the B-52 already deployed to Asia-pacific as well as the stealthy B-2. Furthermore, there will be direct re-deployments directly from the US of other “space, cyber, tactical aircraft and bomber forces… including 60 percent of combat-coded F-22s.” As for the Army and Marine Corps, in addition to the 91000-strong force already assigned to the Asia-Pacific, another 60000 soldiers will be added using the assets in the CENTCOM area. 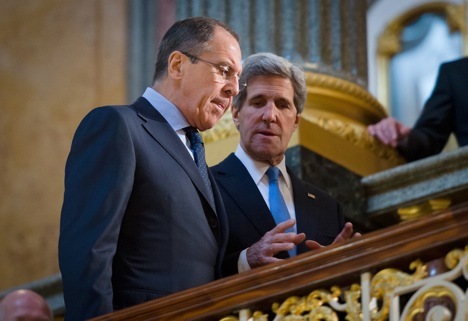 To be sure, Kerry’s talks in Beijing will be keenly watched in Moscow and New Delhi. Major policy challenges lie ahead for Russia and India. The heart of the matter is that polemics can be deceptive when it comes to Sino-American relations. But specifics matter. And Carter brought in a lot of specifics. He even underlined that the priority in the envisaged Pentagon budget will be for development of platforms and capabilities “that have direct applicability to the Asia-Pacific region” – such as the Virginia-class nuclear powered submarine with new payload module for cruise missiles, P-8 Maritime Surveillance Aircraft, anti-Submarine MH-60 helicopter, EA-18G electronic aircraft, Next Generation Jammer, fifth-generation Joint Strike Fighter, the new stealth bomber, KC-46 tanker replacement and a host of ISR platforms.